Synopsis: Film proposal for Maghreb immigration in Belgium. This film is about an uprising. Not like those we watch on television, not those that are forgotten. This film is an invisible and silent 'uprising' between a girl and a minister. One morning in September, the minister whispers to the girl: 'I wonder if there is a link between ethnicity and crime'. The earth trembles, the girl climbs to the wall. She thinks of the young people she meets in the street, she thinks of her brothers, her father. Yes, she thinks of her father who no longer wants to see her, she thinks about a 1964 letter of record, which invited the Moroccans to come and work in Belgium. And in the 1980s, when politicians threw 'immigrants down'. And it's like a 'native earthquake'. At the bottom of the wall, a boy from nowhere looks at her. Together, they decide to leave in search of a history of Maghrebian immigration to Belgium. This is a film in several stages. 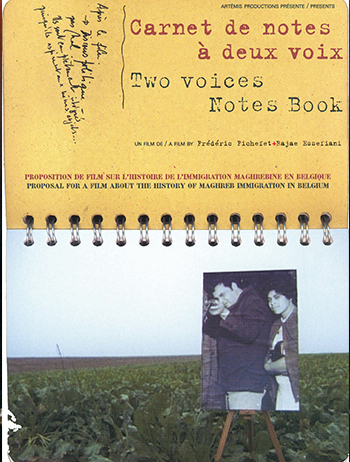 'Notebook with two voices' is the prologue.